Coaching will enable you to increase your own personal performance, unlock your own potential while helping your team to maximise theirs. Starting from a point of awareness, any challenge or behaviour can be focused on and improved. A High Performing Sports person knows that you don’t reach your potential alone, why would you do it in business? Having a coach to support your journey enables you to get clarity on your goals and what’s required to get you to peak performance both at work and in life. What does the coaching process involve? Coaching begins by meeting with Stakeholders and outlining the combined goals of the intervention. Input sought from Stakeholders and adjustments made if any. Supporters are brought on board to measure progress. Progress is measured through self evaluation and pulse survey results. Development Plan is created at the end of the coaching process to help the manager and coachee continue to monitor desired behaviour and goals. "Ciara helped me to navigate my progression in Leadership, she facilitated clarity and focus to enable me to reach my goals"
Leadership Coaching will enable each leader to unlock their own individual potential, while growing and nurturing their team. 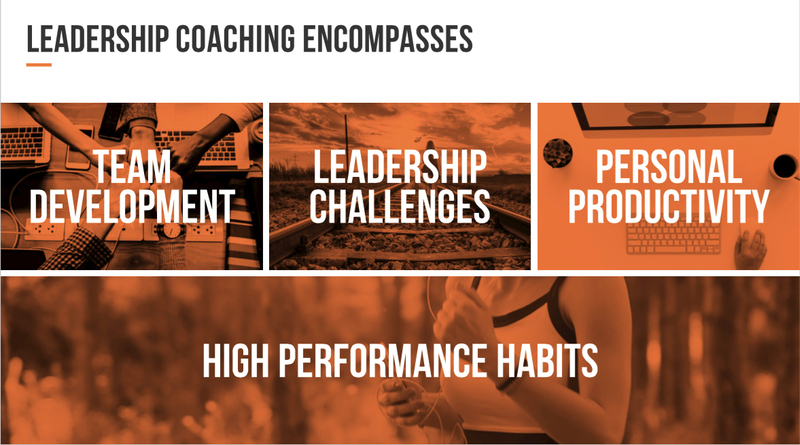 This coaching encourages each leader to work towards creating High Performance Habits and identify and focus on developing the behaviours required to get them to the next level of their career. Productivity coaching is perfect for Executives or any professional who doesn't have the time to come to a workshop and later spend time integrating our system. I come to you. We will spend 1 to 2 days co-designing a Workflow Management system which matches your way of thinking and working.